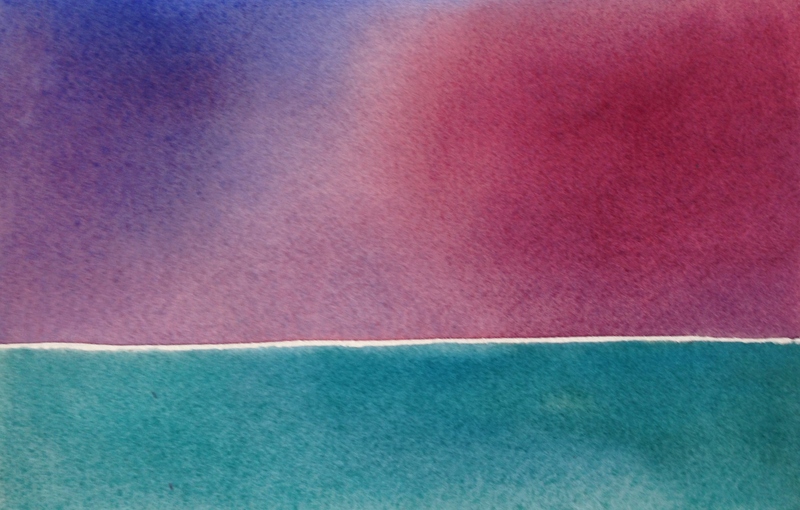 I shall “try, try again” because I’m determined to paint ocean scenes convincingly in watercolor, BUT I’m wondering if there is any way to save the 1/4 sheet of watercolor paper I used. The issue was with a mix of cobalt blue and burnt sienna that wouldn’t soften because I didn’t get to it quickly enough. (Well, there were other issues with the painting, but that was the main one.) I wish I could save the sky and the tree line and the sand in the foreground and just delete the middle ground (waves) and start over. Oh well, lesson learned. Now I know that I need to try the waves on scrap paper, because that’s probably the hardest part of the painting. It looked so easy on the tutorial though! Grant Fuller is a really good teacher, and the painting he did is beautiful. Maybe someday, I will be able to paint a seascape. I’m pretty stubborn, so there’s that. Happy Monday, let it be a fun day for you and yours today. Peace and gentle waves from me to you! Have you heard of a Mr Clean eraser? It’s a type of household sponge. It will generally lift watercolor paints down to the paper. It’s not perfect but I’ve saved several paintings with it. That’s a good idea Sue. I have heard that can work, but I’d forgot all about it. That’s a good idea, I will try on a piece of scrap paper first. Thank you! Have you tried this on all types of paper? I imagine it would work on anything, but hopefully it doesn’t harm the paper? You’ll see right away how it will work. Usually gentle blotting solves the problem. Make sure it’s a regular Mr Clean eraser, not one with bleach or detergents. Your paper should be fine if you don’t scrub. I cut the eraser into four pieces, more corners to use. Thank you and it was pressure free, which also helped after holding my breath for about two hours with the other painting! One thing I also learned is that I’m not ready for large paintings. I guess if you learn something, it’s all good. Learning is pretty much the whole point so I’d say it’s definitely all good :). I think large paintings require a lot more planning. I like working in my small A5 sketchbooks for the most part. It reduces the pressure to fill the page. Well I was trying to follow a video tutorial, and this is what he used. I figured as long as I copy him exactly, Presto! Except….not so much. Although I was happy with the sky and wet sand! And the treeline was ok too. So it wasn’t a total loss. Well that’s good. Sounds like you got some good experience there then. peaceful, serene….those words come to mind. ….it is quite lovely as is, I think, Laura. So often the sea is tranquille, which it is here. The biggest lesson watercolour has for me (always) is that it is not a medium which takes kindly to will. It does what IT does, and a watercolourist learns how to follow along–or ultimately chooses a medium which is more able to be controlled. It is a personality thing, and I know many many artists who have begun with watercolour and ultimately decided another medium was more of a fit. However, even though I’ve gotten extremely frustrated with watercolour over the years, just that alone (my frustration) made me realise it was me who needed to learn how to go with another’s lead, rather than always want something to turn out the way I wanted it to. If this is useful, great. And if it isn’t, that’s also great. I appreciate the opportunity, is all. And I love this little piece, Laura. Lance, I really appreciate your time and thoughtful response. I may post the painting fail, just to see what everyone thinks. It was my first try with an 11×15″ piece of paper. I did this small one as a little cool down after the major disappointment of not succeeding with the rolling waves in the other one. You are of course correct in your assessment of the medium and rolling with it as the artist. Usually I’m able to do that, because as you said, I’ve had to learn to do it, or else stop painting with watercolor altogether! I’m pretty determined to get rolling waves without gouache or mask……I may not get there, but at least I have a triple dose of stubbornness! I was trying to follow a video tutorial, and that was difficult, trying to rewind and get to just the right spot while the paper was drying. I do think a book would be better, but finding a book that demonstrates the techniques without the mask is proving to be difficult. If you know of one, I’d sure be obliged. Thanks again for your encouragement and visit. They are much appreciated, as you are one of the watercolorists here whose work I admire most. The best gifts come in small packages. Thank you for sharing your awesome abstract! Thanks, Sharon! I’m glad you enjoyed it!! Thank you, Fabio! I may post the (failed) painting that inspired this one later on in the week. I almost gave up on it, but I’m going to add the trees and rocks and see if it might be worth posting as a learning experience. I always appreciate your visits and comments! I’m really glad that I could inspire that. Thank you so much, Fabio! There’s no way I could have done that in this case, Jill. Maybe my memory is that bad? Not sure, but there was a lot going on in that painting, and in most cases I was painting things I’ve never painted before. I am still very new with watercolor and have a whole ton to learn. I wouldn’t have tried that without watching him and going step by step. I think the video was an hour and a half, or something close. Too much info for me to remember, although I admire you for being able to do that! Yeah I had a little block of time and wanted to do something cool with it. I learned my lesson though. I’m glad he composed and came up with the colors, because no way will I paint something that large again anytime soon. The other commenters had some great suggestions for saving/reusing the paper (I’ve never tried Mr. Clean eraser before), but I really love this painting as is (like everyone else). I think that if you didn’t want to call it a landscape or seascape, it makes for an amazing abstract painting! Hi Teresa, thanks! I like this painting too. I haven’t posted the painting that didn’t turn out. I may post it later, if I decide to go ahead and finish it. I had luck running my rooster under water…you might try that. Thank you! I try to remember that when a WC painting goes awry and becomes an abstract and I start looking for colors to add. I love the combination of the colours and think it looks great just as it is! Thanks, Tori! I like this one too. I’m still thinking about posting the bad one, but I may finish it first. It didn’t look as bad the next morning. This may be a little late now, sorry! But have you looked into watercolor ground? It’s basically a resurfacing medium, I haven’t tried it myself but supposedly you can paint it over whole sections to cover mistakes, and then paint on top of it since it dries to a paper-like finish. Daniel Smith makes some, and so does Golden, I think. I didn’t know about that, and I’m really glad you let me know! Thanks!